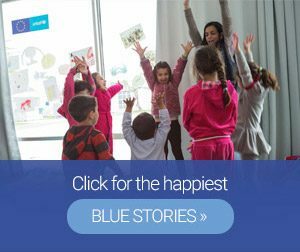 Blue stories are happy stories! For the protection of the most vulnerable refugee and migrant groups, special support centers –already known as “Blue Dots”- for children, women and families are being operated in more than 10 points across Greece to provide vital services, counselling and play in a single location. 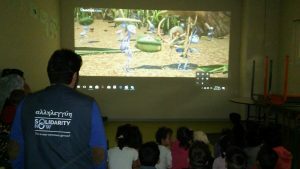 The BlueDot program is implemented by SolidarityNow, supported by UNICEF and funded by the European Commission – Civil Protection & Humanitarian Aid Operations – ECHO. Everyday, SolidarityNow teams live the stories of the people they are helping and most of all they create new stories together with them. Stories which inspire joy and hope. Small, everyday stories that we have collected and share with you …. On the occasion of World Children Day, the #SolidarityNow team at the Refugee Reception Center in Drama, share some moments of #laughter, relaxation and carelessness with the #children, with the screening of a children’s #film. We all enjoyed it so much! 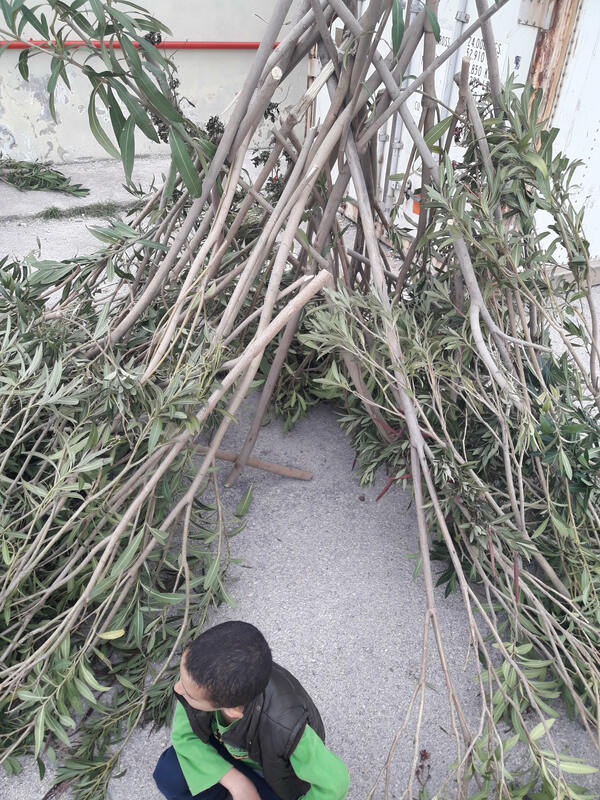 The old #tourist accommodations in the small spa town of Volvi, for the past year have been housing Yazidi families, as well as people from Congo, Somalia, Eritrea, Afganistan, Syria and Pakistan. 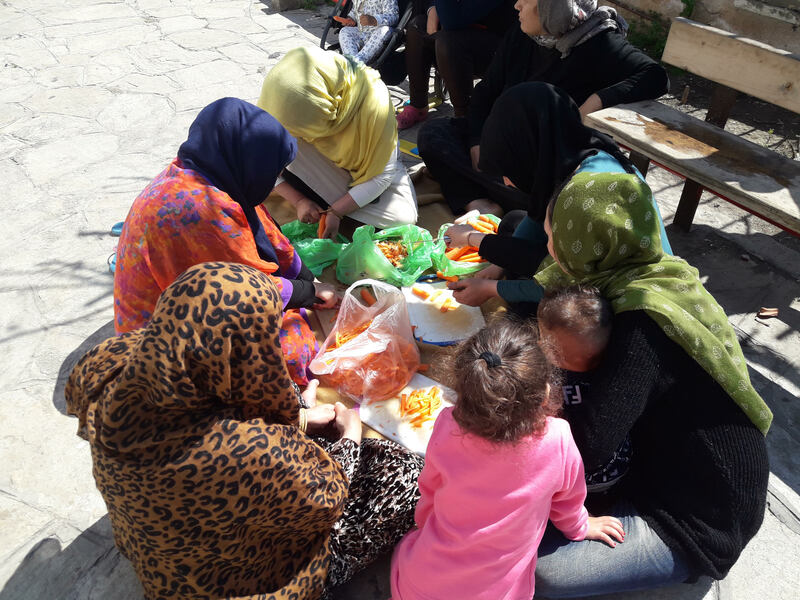 Due to the diversity of the population and in the context of SolidarityNow Blue Dots program a barbecue was organized outside the Child & Family Care Hub. Everyone enjoyed themselves beyond borders and differences. They sang their traditional songs, they danced, they cooked and ate all together. The friends and family of SolidarityNow’s employees were also there! * Iliaktida as UNHCR’s partner has the management of Volvi Accommodation Scheme, through IATAP. SolidarityNow loves women’s #volleyball! 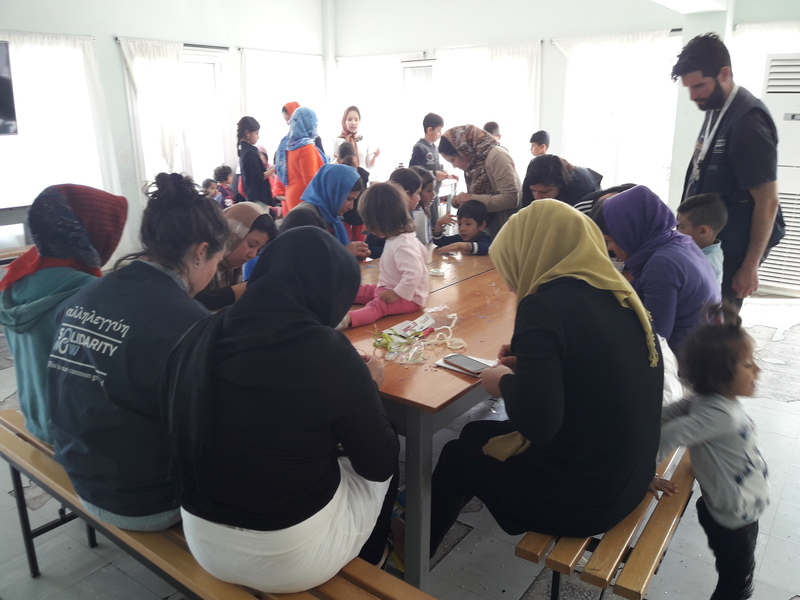 Last Saturday, 23 teenagers-beneficiaries of SolidarityNow’s Blue #Refugee Center* from Syria, Afghanistan, Iran and Iraq, had the chance to go to watch a volleyball match in the context of the #Greekwomen’s #Volleyball Cup. The game took place in the indoor arena of the Municipal Stadium of Pylaia. The match was between A.C. Aris and A.O. Makropoulo. We would like to thank A.C. Aris Women’s Volleyball Team and its Manager Mr. Yiannis Yiannakis for giving the opportunity to SolidarityNow’s beneficiaries to attend the match and meet the team! 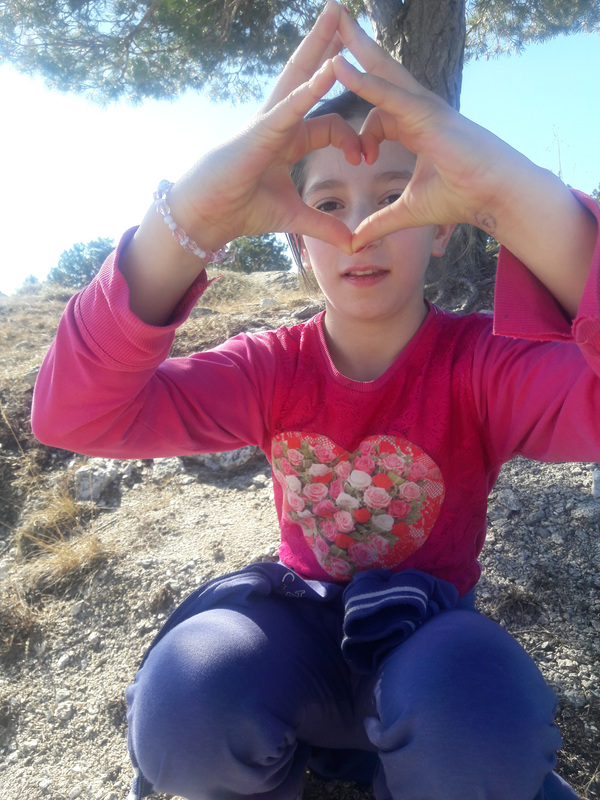 In SolidarityNow we support the integration of refugees and immigrants in the Greek society through #sports! “The sky is our limit”. 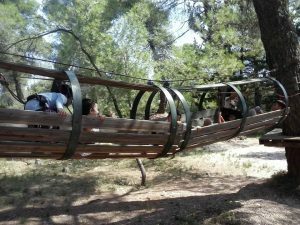 With these words the children of Elefsina hosting structure expressed the empowerment they experienced at the Adventure Park at Malakasa, challenging their physical skills, feeling like super heroes in this marvelous adventure! We would like to thank the Adventure Park for their kind hospitality. «When toys talk…»: When the girls from the Elefsina camp, held their handmade dolls in their hands, then suddenly…the dolls found their breath and narrated stories that the gilrs could not articulate. The girls’ stories met with a book tale. “How do you take your tea?” Through this story, girls and dolls revealed big and tiny secrets, related to this daily habit. We would like to thank #Traumateddy and Shelley Deane for the offered opportunity. Each child opened the box and smiled as they saw themselves in the secret box with the mirror. 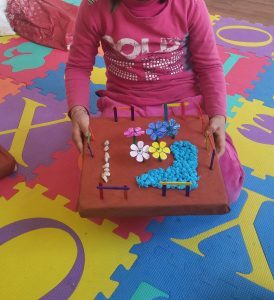 With the occasion of World Children Day, the #SolidarityNow’s #Blue #Dot team at the reception center in #Thebes, a game of hidden treasure for the children. 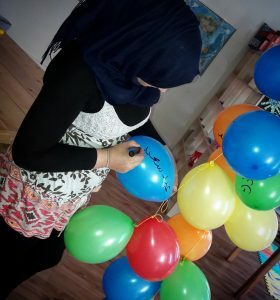 The children’s rights were transformed to games, peace posters, homemade smells, hide and seek, games, video, teasing, a clean environment, and discussion on the importance of knowledge … Parents and children, in groups or individually holding their “map” started looking … for their rights! 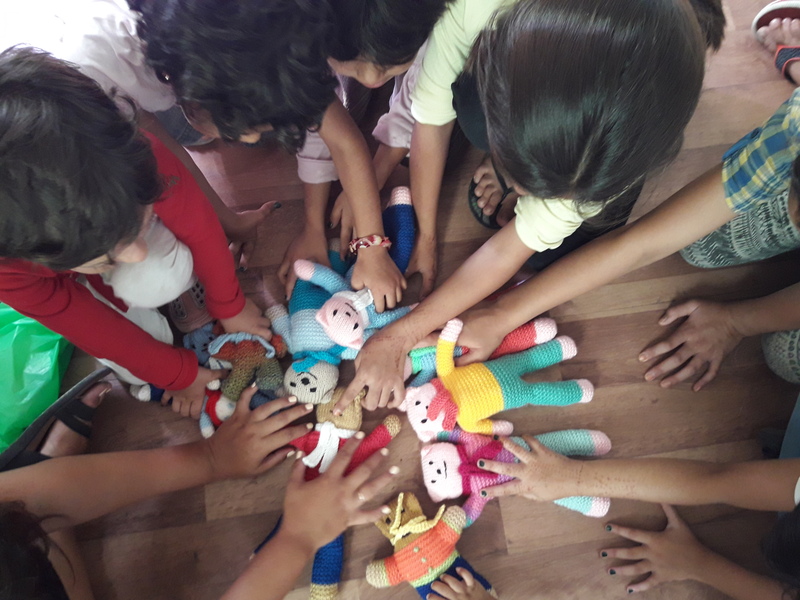 In the Child Friendly Space* of #SolidarityNow in Drama, the story of the Whirl Witch who ate the children’s #toys was the inspiration to explain to the #children a basic right which, quite obviously, is often overshadowed: their right to play! Because as they showed us through their #drawings, a world without toys is a bad #world! Recognizing the respective needs of the #beneficiaries and the lack of legal #information, especially for the newcomers to the #Hospitality Center of Thebes, the SolidarityNow team, with the valuable collaboration of the Athens Solidarity Center, provided legal information in groups with the participation of families, single men and unaccompanied minors. The briefings were mainly related to asylum and rights issues and were given in Farsi, Arabic, Sorani, Kirmanji and Urdu. Participation was great and the #questions that were risen were answered by the experts and the relevant printed material. 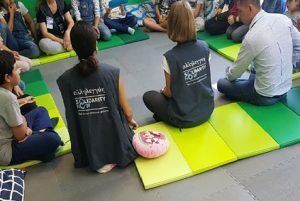 SolidarityNow’s Child Friendly Space in Drama, organized for the children a series of activities about the animal rights. Specifically, they started by showing them pictures that depicted animals’ rights. Then, they discussed each picture, giving them the chance to say what it is depicted in each one. 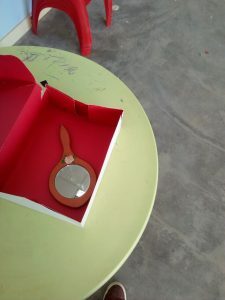 After that, they made a group project titled: “The Earth does not belong only to humans”. On a cardboard, they drew and painted the Earth, putting around it different kind of handprinted animals created by the kids. Then, the children were asked what each animal might need. “Love, care, food and water” were some of their answers! On September 1st, SolidarityNow‘s Blue Dot team at the reception center in Thebes, organized a painting activity on large surfaces, thus participating in the celebration of the Muslim Easter. 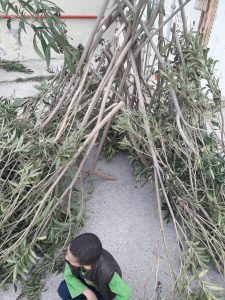 Children of all ages with their parents as well unaccompanied minors were drawing together aiming at the emotional expression of children and the cultivation of a spirit of cooperation. A professional painter was there too, sharing his knowledge on techniques of using the right brushes and colors! 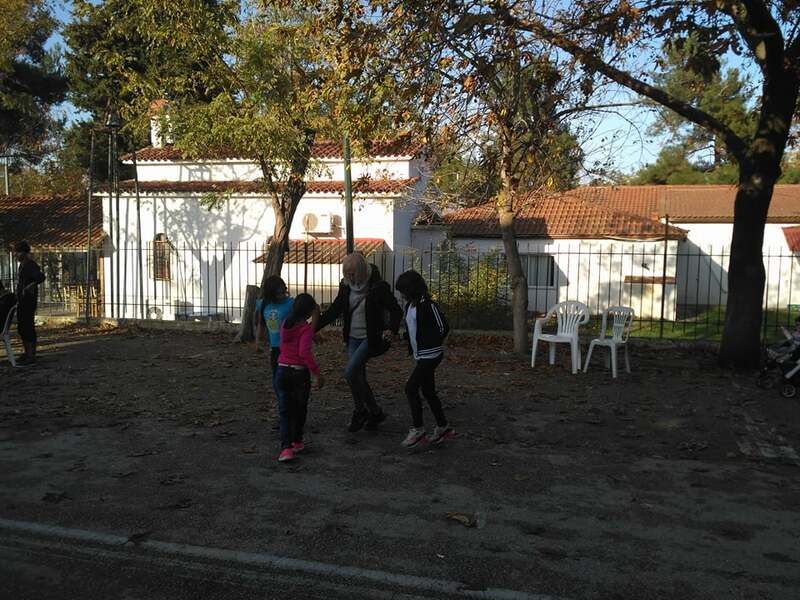 We celebrated together with our beneficiaries in Thessaloniki! In particular, at the Children’s and Family Protection Hub (Blue Dot), on the occasion of the Eid Al Adha celebration, we enjoyed food, festive cookies made by the beneficiaries themselves, gifts for children, songs, dancing, and much laughter! People from different countries – Syria, Congo, Pakistan, Iran, Iraq, Palestine – were given the opportunity to dance their traditional dances from around the world! A multicultural feast, a celebration of love and solidarity! The 1st Experimental Workshop of the Child & Family Support Hub has been successfully completed through a journey full of colour, music and action! 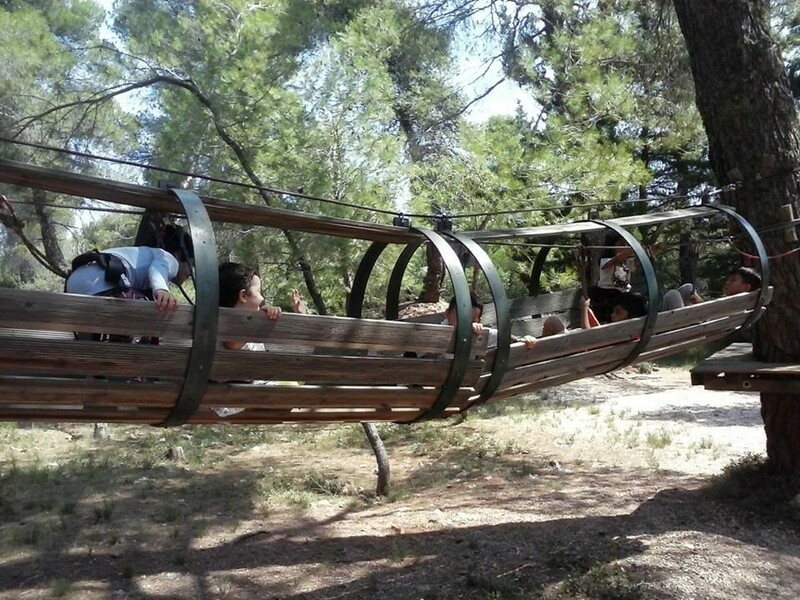 The children’s smile and energy became our strength through to make the adventurous journey to the feelings’ island of the composer, Manos Hatzidakis. Joy and sadness alternated while we were travelling through different landscapes and places with love being our guide. Due to great participation, the action is going to be repeated for our little friends! Music has no borders, no color, race or religion! Music brings us together! 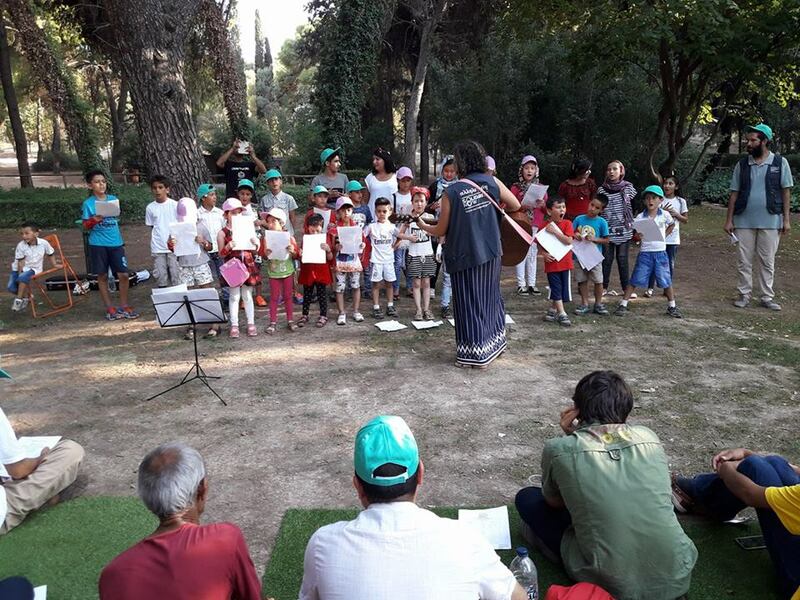 With this message the 30 children of our choir, composed of refugee children living at the Elefsina camp, sang in Greek, English and Farsi at the Haidari Botanical Garden. 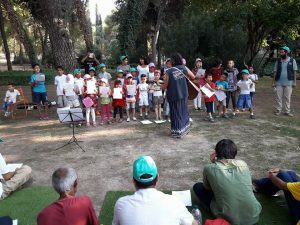 In this special summer party organized by the SolidarityNow Blue Dot** team, the children left their life in the camp for a while and remembered how it is to play, have fun and sing carelessly. Because for All children, life must be Joyful! 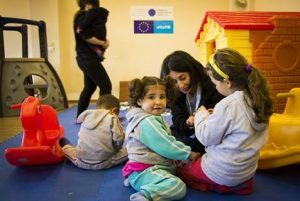 In the very center of Athens, SolidarityNow’s new Blue Dot hub welcomes everyday dozens of refugee children who come to spend their time but also to learn new, exciting things! 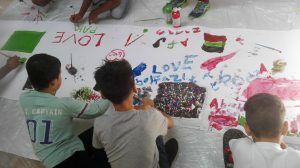 Creative activities of art and theater, board games, books, painting, reading and singing as well a bunch of other activities delivered by the #SolidarityNow team, fill the hearts of these kids with joy! The SolidarityNow Team of the #BlueDot Center in Kavalari organized its own gymnastic demonstrations at the end of the school year! 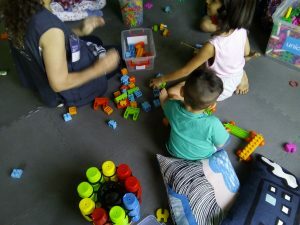 The young beneficiaries of our program took part with joy, while their proud parents were watching and encouraging them! A celebration of well-being and happiness, where everyone has won. We shared smiles and gave medals medals to everyone – even to our youngest friends – and of course countless applause for their wonderful effort and courage! Are you afraid of the lions? 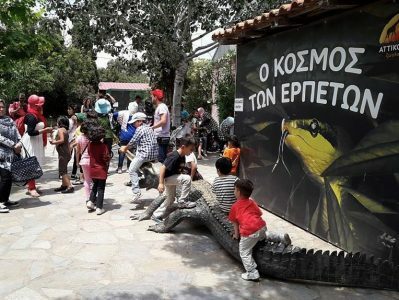 The snakes; The crocodiles? 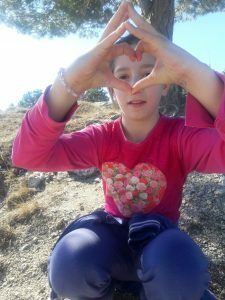 Our little friends and benficiaries of SolidarityNow’s BlueDot Elefsina project, however, seemed not to be scared at all! On the contrary, the visit of the Attica Zoological by the children and their parents living in the Elefsina camp, will surely be unforgettable as they met many of the animals for the very first time! A very interesting and useful session was organized by our active team at Elefsina! 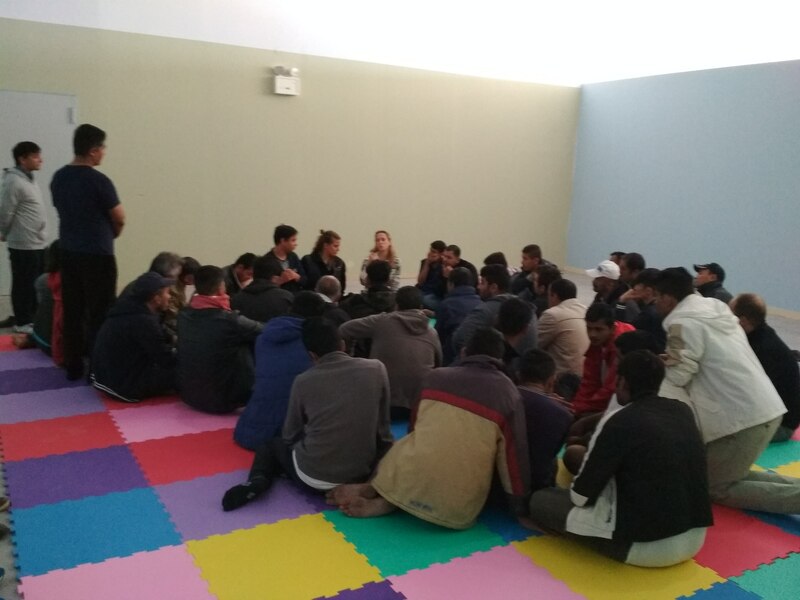 Our Blue Dot team in Elefsina, with the collaboration of the legal service of Athens Solidarity Center, realized a legal briefing to the inhabitants of the refugee camp of Elefsina. During the two meetings, the participation rate by both women and men was high. At the end of the meetings, discussion was held, questions were answered and brochures with relevant information was distributed. The topics covered were human rights and asylum, family reunification, etc. Also, a special reference was made to issues regarding gender violence and abuse. 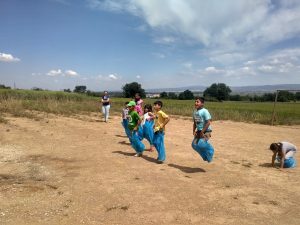 SolidarityNow team of the BlueDot program in Elefsina escorted the children from the refugee camp in the area to a 5X5 pitch to play football with their peers from nearby schools. In an effort to get in touch with the community, the children played and mingled with each other! Αt the end of the event, each little player received a ball as a gift! Thank you all! “Loose parts” are objects that are not toys. Instead, everything can be used to play with emphasizing in the procedure rather than the result. Children at the Elefsina Refugee Camp, in the context of BlueDots program by SolidarityNow, used plastic bags, branches and strings to bring in Greece something from the place they come. The result: some wonderful kites ! Spring struck us to Kavalari, and the BlueDot SolidarityNow team together with our young beneficiaries celebrated it by making small indoor gardens! We picked up our materials, we grew our lawn, we put water in the pond, we decorated it with some stones and we planted nice flowers! 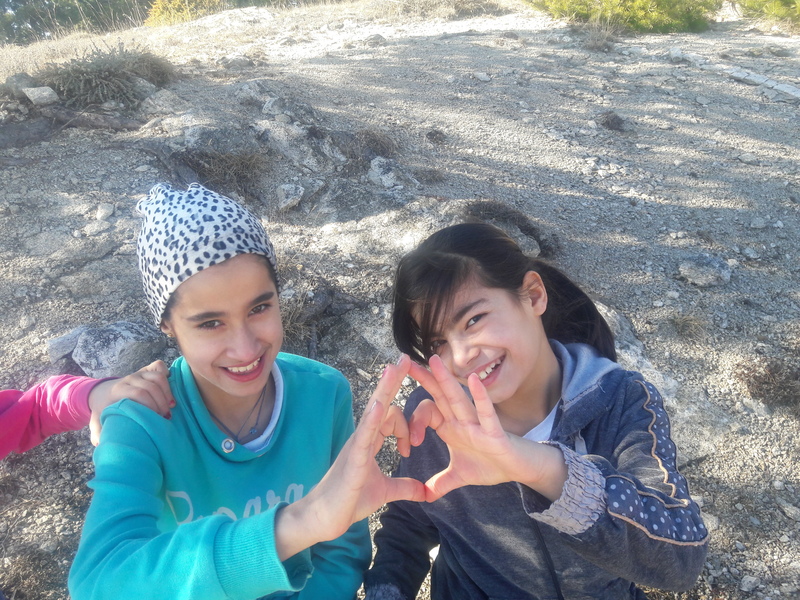 Each activity is the occasion for a new activity for SolidarityNow team at the Elefsina camp in the context of the BlueDot program. the concept of personal space and any feelings associated with it. Just think how hard is for the children to open up about the traumatic issue of the abandonment of their own homes. But this activity also had its entertaining side! 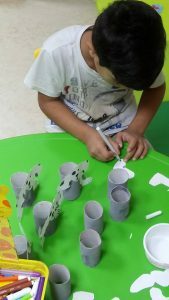 The use of materials has led children to use their imagination and work together! There are many ways to feel the concept of family, to create and ultimately to maintain what we call “family bonds”. The love that makes you feel another person like brother or sister has nothing to do with the blood. Love goes beyond the decisions of the grownups, the pain, or the conflicts! 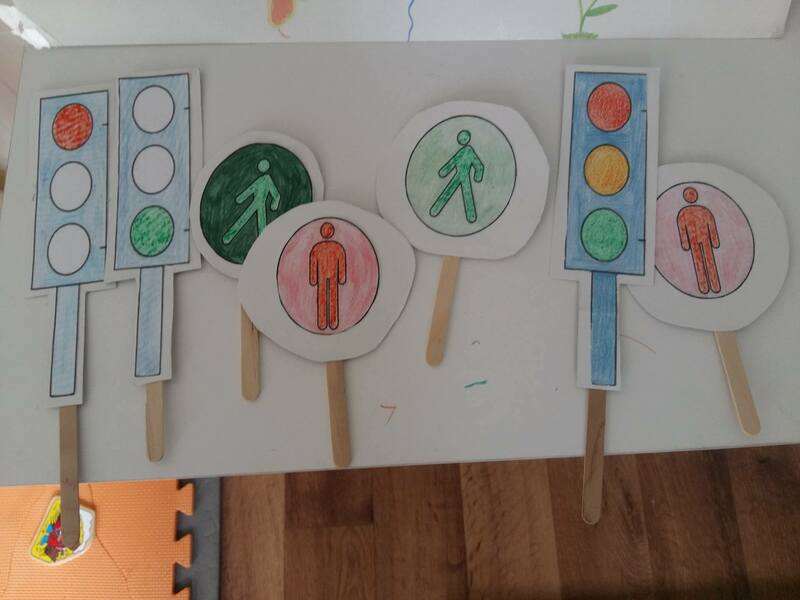 The highly creative team of SolidarityNow’s BlueDot in Faneromeni – Ioannina implemented an entertaining traffic education course for the young beneficiaries of the program. Altogether they crafted traffic lights and traffic signs, and after the children learned about their usefulness, they played various interactive games to better understand the importance to respect the traffic rules and to be careful when being on the road – whether you’re an adult or a child! 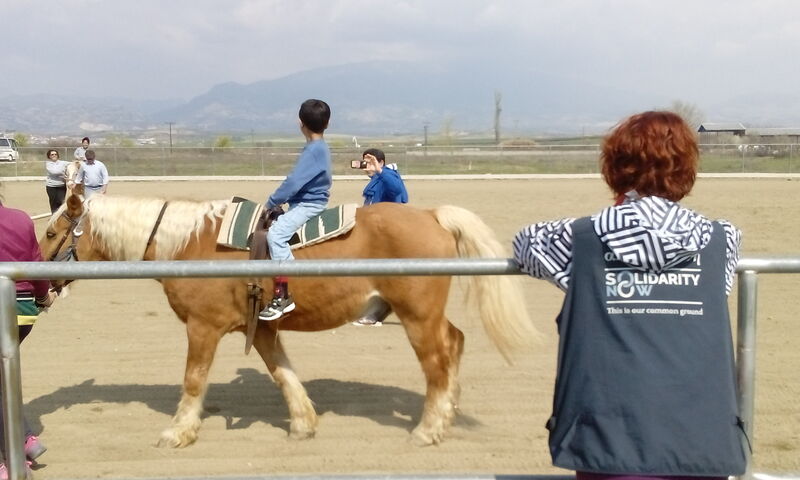 The BlueDot team of SolidarityNow in Drama, visited Serres Therapeutic Equestrian Center, along with 76 beneficiaries – including 45 children. We had such a great time playing, have a picnic, and of course horse riding! Esra, one of our BlueDot beneficiaries, was still pregnant when we met. Our team was since by her side, providing the necessary counseling and care during her pregnancy. Time went by and the day came when little Ali was about to come to our world. 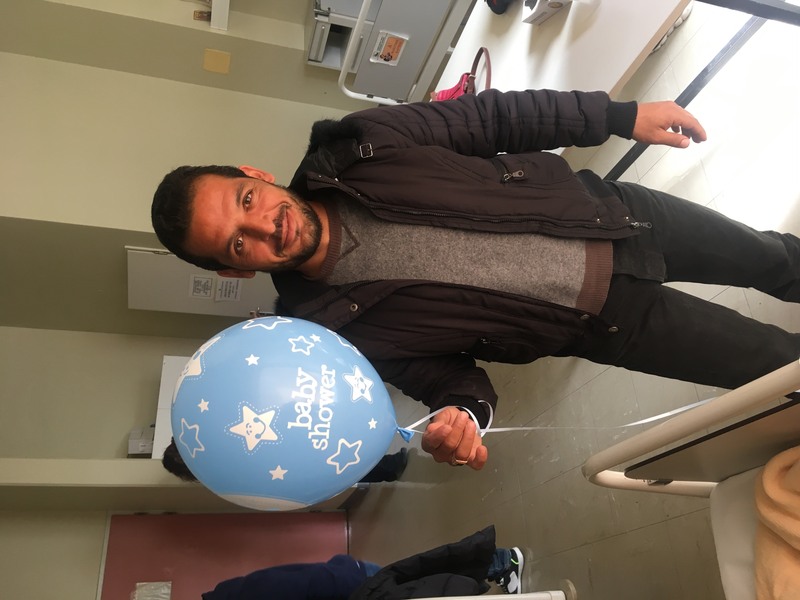 With his father Mahmud we were waiting outside the door of the delivery room, when a nurse let us know about a slight that worried us a great deal. But finally, all went well and since then we don’t enough of seeing our cute boy! 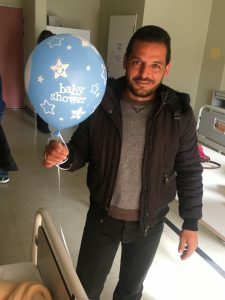 The parents are more than happy! And so are we! 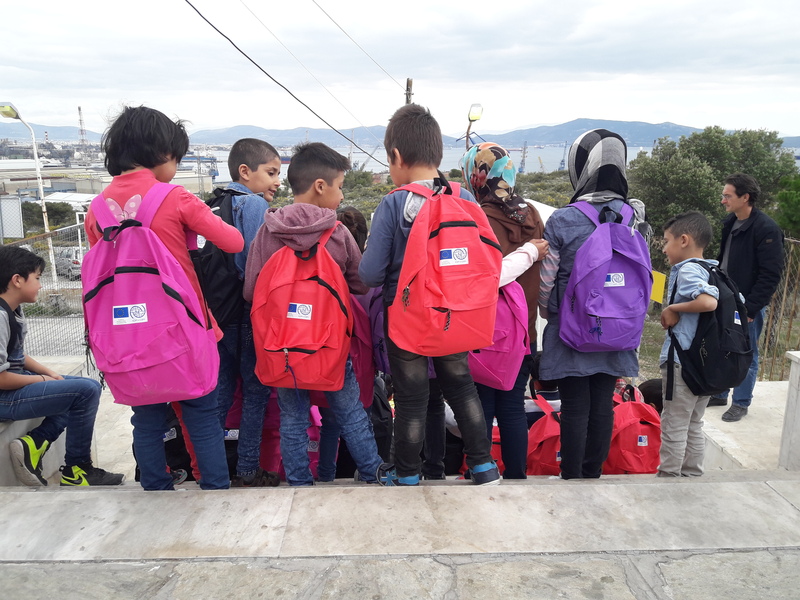 First day at school yesterday for the young beneficiaries of our BlueDot program at Elefsina, a program implanted by SolidarityNow, supported by UNICEF and funded by the EU. SolidarityNow was beside them in during this joyful moment. 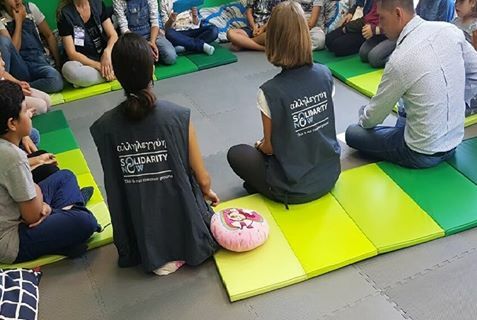 We help the children get prepared and escorted them to the school with our interpreters and the scientific staff in order to work together with their teachers for their smooth integration. The reception of children by the parents, students, teachers and neighbors was really moving, with all these banners, songs, gifts and treats. 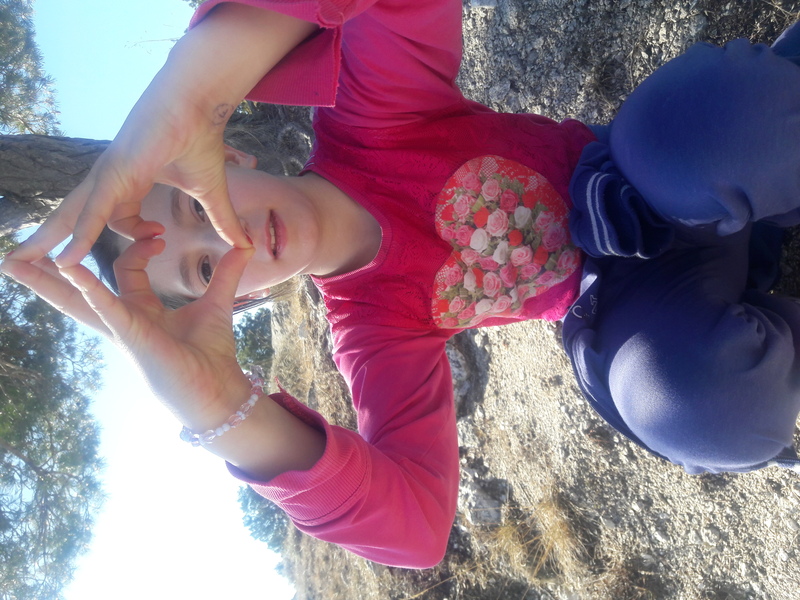 The BlueDot at Doliana team organised a very interesting, useful and … funny activity for the young beneficiaries of the program concerning the hygiene of their hands! 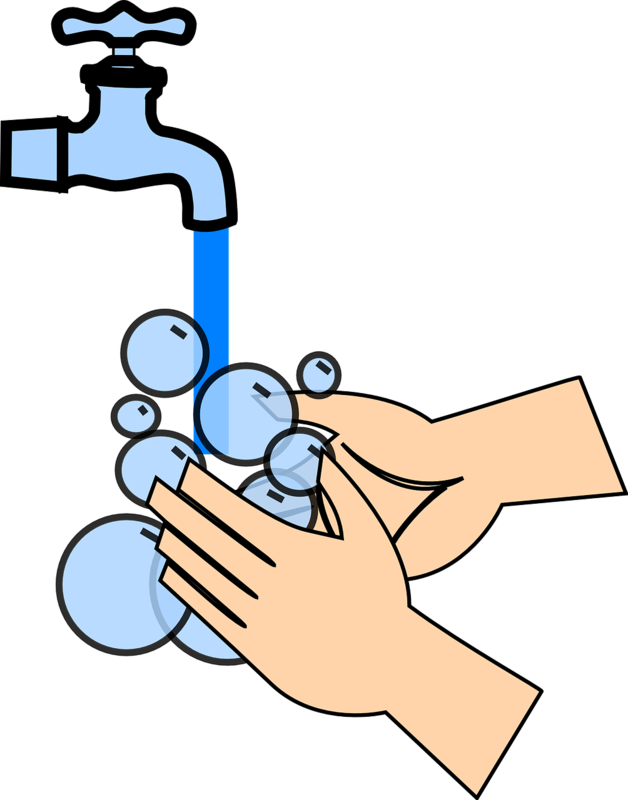 The need of daily care and hygiene is imperative in all our structures – especially when it concerns the children! And when it is taught in a fun way, the kids never forget it! We celebrate the first day of spring and the first day of the persian year – aka Norooz. Beneficiaries of the program together with the team of SolidarityNow set the traditional table, cooked with the help of the NGO”The Other Man”, we dance we have fun! Happy new year! Νοrooz Mabarak! “Children here can rest, forget the war and the difficult journey they made and they can also express their dreams: one of them wants to become a horseman and another wants to work for NASA,” says a member of SolidarityNow team in the BlueDot in Serres where 45 children from Syria are learning sports, are doing creative and artistic activities to develop their cognitive capabilities. Epaminondas Farmakis, Managing Director of SolidarityNow.